On Monday 26th June from 9am to 2am, Tim Etchells and collaborators Aisha Orazbayeva and Uriel Barthélémi stage a durational intervention at Savvy Contemporary in Berlin at part of documenta 14. Themed around emergency, the radio broadcast from the gallery comprises pre-recorded material and extended live improvisation using voice (Etchells), violin (Orazbayeva) and percussion (Barthélémi). Do drop by the gallery to see the performance live at the times indicated below or listen in online here. Emergency is part of Every Time A Ear di Soun, a documenta 14 Radio Program in collaboration with Deutschlandfunk Kultur that explores sonority and auditory phenomena such as voice, sound, music, and speech as mediums for writing counterhegemonic histories. 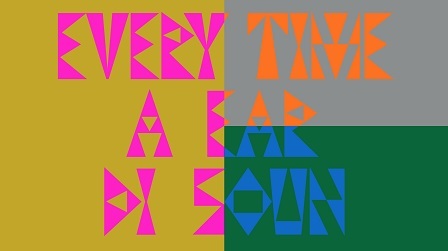 Every Time A Ear di Soun features numerous artists and projects and reflects on how the sonic impacts subjectivities and spaces, especially through the medium of radio. The radio program live streams on FM in Kassel, online from the documenta 14 website, and on shortwave around the world. Based initially on a simple set of simple utterances around the thematic of emergency (in numerous inflections and contexts), Etchells approaches Emergency through techniques of looping/repeating, varying and shifting emphasis and inflection and crosscutting to fragment and explore the language, entering into dialogue with collaborators Orazbayeva and Barthélémi whose work departs from, supports and at times eradicates Etchells’ language. Emergency explores the space between semantic use of language and its more musical, textural, sonic properties and rests on a continuos process of shifting between registers – creating, disintegrating and re-inventing meaning. Tim Etchells is an artist and a writer based in the UK whose work shifts between performance, visual art and fiction. He has worked in a wide variety of contexts, notably as the leader of the world-renowned Sheffield-based performance group Forced Entertainment. Exhibiting and presenting work in significant institutions all over the world, he is currently Professor of Performance & Writing at Lancaster University. Etchells’ work has been shown recently at Tate Modern, Cubitt, Hayward Gallery and Bloomberg SPACE in London, at Turner Contemporary, The Grundy and Compton Verney in the UK, at Witte de With, Rotterdam, and MUHKA (Antwerp). Aisha Orazbayeva is a Kazakh-born London-based violinist. She has released two critically acclaimed solo albums on Nonclassical and PRAH recordings featuring her own compositions, and has performed internationally in venues such as New York’s Carnegie Hall. Recent releases include Bryn Harrison’s Receiving the Approaching Memorywith Mark Knoop on Another Timbre, vinyl EP Seeping Through with Tim Etchells on PRAH recordings and Scelsi’s Duo vinyl EP for violin and cello on SN variations. Aisha regularly performs with ensembles Plus-Minus and Apartment House. Aisha’s third solo album Telemann Fantasias played using contemporary/extended violin techniques was released in November 2016. Uriel Barthélémi is a drummer, composer and electro-acoustic musician. He has collaborated in numerous areas of the performing arts since 2002: dance, marionettes, theatre, as well as the visual arts. Intimately combining drums and electronics, a flexible composing style and improvisation Barthélémi has had works commissioned by Césaré – CNCM, Sacem / CDMC, Al Mamal Art Foundation, Sharjah Art Foundation. He is also an associate composer of the Soundtrack Company and Puce Muse Studios. He collaborates and appears with artists such as Hélène Breschand, Tarek Atoui, Kazuyuki Kishino (KK NULL), Antoine Schmitt, Veronica Vallecillo, Taro Shinoda, Rigo23, Nikhil Chopra, amongst others.He has played and performed in music and performances festivals such as The Jerusalem show IV (2010), Performa (N.Y., 2011), Sharjah Art Biennial 11 & 12 (U.A.E., 2013 & 2015), festival Croisements (Beijing, 2014), Sommer akademie – Zentrum Paul Klee (Bern, Switzerland, 2015), March meeting (Sharjah, 2012 & 2016), Serendipity arts festival (India, 2016), Fiac (Paris 2016).